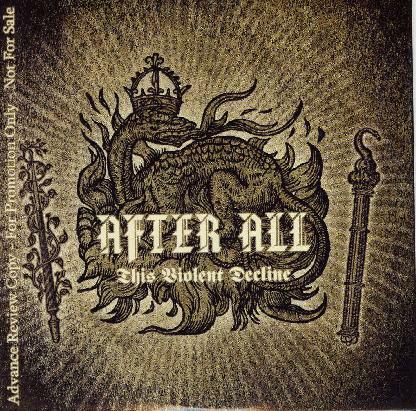 After All - "This Violent Decline"
After All are a melodic Thrash metal band from Belgium and this is their second CD. The band have toured a lot with King Diamond, Destruction, Agent Steel and others since their last record and this is reflected in the new record. It has a great sound production due to help by Fredrik Nordström (In Flames, Arch Enemy, Soilwork) who did the mixing at Studio Fredman and the mastering was performed by Danish producer Tue Madsen. While the music is very inspired by King Diamond and old school 80's thrash, the vocal style is not like the King at all. It seems that also in this genre of music the guitar solo is a dying art as most of the solo guitars are used purely as melodic instruments. Anyway, some great tracks and a really great sound on this CD. For more information you can visit the After All web site at: http://www.afterall.be. Visit the Dockyard web site at: http://www.dockyard1.com.